Bring a Daedra heart to Moth gro-Bagol. Return with a Daedra heart. 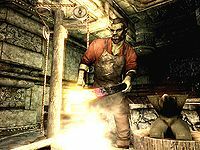 Moth gro-Bagol has been ordered to make a special weapon for the Jarl of Markarth. To do so he needs to dip it in the blood of a Daedra. All he needs is a heart though, and would appreciate it if you could bring him one. He will give you a random base piece of armor in return. If you are not an Orc or already Blood-Kin, and have not stolen from him, he may tell the Orc strongholds that you are to be considered Blood-Kin by the tribes. This quest raises his disposition towards you, allowing you to marry him. On the PC, it is possible to use the console to advance through the quest by entering setstage FreeformMarkarthN stage, where stage is the number of the stage you wish to complete. It is not possible to un-complete (i.e. go back) quest stages, but it is possible to clear all stages of the quest using resetquest FreeformMarkarthN. This page was last modified on 14 July 2014, at 05:01.